ROCHESTER/ROCHESTER HILLS/OAKLAND TOWNSHIP — The Southeast Michigan Council of Governments is preparing to offer a new resource to residents and visitors to the southeast Michigan area: visual mapping of several of the region’s parks, trails and waterways. Comparing the resource to Google Maps, SEMCOG has partnered with Terrain360, a company that uses high-resolution, panoramic, 360-degree digital cameras to capture images that allow users of SEMCOG’s Michigan Park Finder app to view three-dimensional tours of those trails. Areas in Oakland County that will be mapped in this way include 55 miles of hiking and biking trails, including at Addison Oaks County Park and on the Clinton River, Paint Creek, Polly Ann and West Bloomfield trails. SEMCOG also will map 41 miles of water trails in Oakland County, including along the Clinton River. The mapping process will take place throughout July, and the 360-degree images will be ready for the public in the autumn. Last week, Andy Thompson and Ryan Abrahamsen, of Terrain360, were in the Rochester area mapping the trails and waterways. Thompson hit the Paint Creek and Clinton River trails on a trike equipped with five mounted cameras — complete with light sensors that allow computers to change shutter speeds automatically while on location. 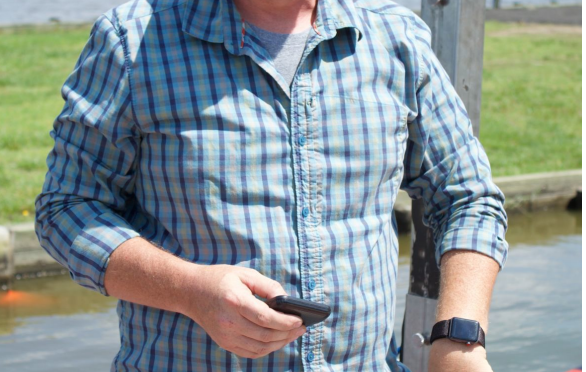 Abrahamsen climbed aboard a twin-pontoon watercraft equipped with six cameras to capture a 360-degree image about every 50 feet for mapping. Thompson said it’s like Google Street View for trails and waterways. The resource will be available through SEMCOG’s Michigan Park Finder app. Vettraino thinks this will encourage more residents to visit the trails and help them plan new outdoor activities. Vettraino said adding this resource to the region will not only aid local residents, but also help promote tourism. Those affiliated with the trails are looking forward to being able to use the maps to better assist those they serve, and they also hope the tool will help draw in potential new trail users. Paint Creek Trail Manager Kristen Myers said the Paint Creek Trailways Commission is excited to be part of SEMCOG’s Terrain360 project. “We had been looking into ways to provide new visitors this type of Google Street View imagery for a while. As part of the state’s Iron Belle Trail Network and a trail of regional significance, the Paint Creek Trail is a perfect location for part of this project. Current and new visitors will be able to see a preview of the beautiful surroundings and native plant communities, as well as view the amenities we provide. We hope the 360-degree imagery captures the essence of the Paint Creek Trail and the Paint Creek itself, and look forward to our on-the-ground trail view to be integrated into the Michigan Park Finder website as well as our website, www.paintcreektrail.org,” Myers said in an email. Friends of the Clinton River Trail President Richard Harrison said the project helps promote trails and thus adds to the quality of life in the surrounding communities. “Trails enhance the quality of life hugely … so I think (this project) is fantastic. You will be able to go on the internet and actually go down the trail,” he said. Harrison said the mapping tool will help familiarize users with new areas of the trail they haven’t yet explored. The Clinton River Trail passes through five cities in the middle of Oakland County — Rochester, Rochester Hills, Auburn Hills, Pontiac and Sylvan Lake. 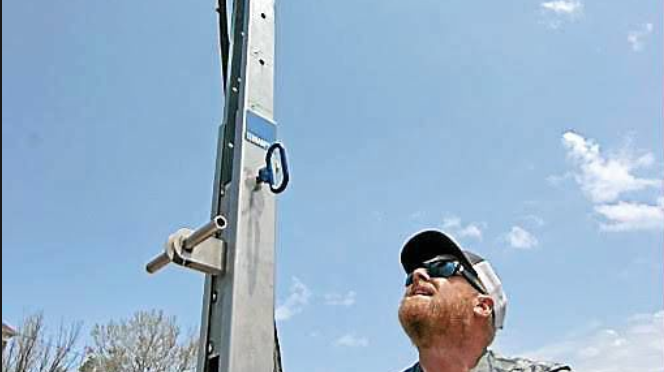 “Allowing one to become familiar with our trail assets and challenges will make the participants more comfortable using Oakland County’s fine network of trails,” he said. 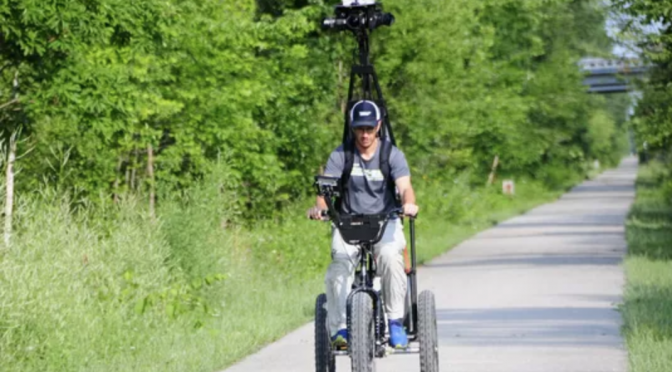 Digital imaging similar to Google Street View will soon be available for 680 miles of hiking, biking and water trails in southeast Michigan. 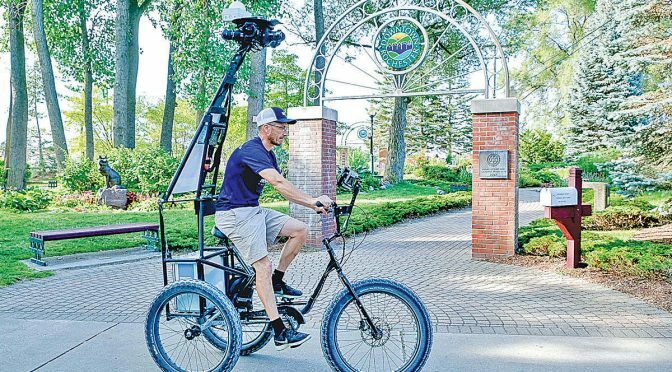 The Southeast Michigan Council of Governments (SEMCOG) is partnering with Terrain360 to capture high-resolution, 360-degree images of the region’s hiking and biking trails, trailheads, points of interest along trails, rivers, riverbanks, access points on rivers and boat or kayak launches, according to a news release. Camera operators will capture trails from July 8 to July 18. “This visual mapping of our region’s trail network will be integrated into Southeast Michigan ParkFinder, allowing lovers of the outdoors to preview regional assets in a virtual environment and prepare for their real-life outdoor adventures,” SEMCOG Director Kathleen Lomako said in a news release. Macomb County: 36 miles, including Macomb Orchard Trail, Clinton River Park Trail and River Bends Park Trail. WEAR) — In order to preserve the historic Blackwater River for future generations, conservationists are acting now to record the history of the river, which can be traced back hundreds of years. The idea of the project – virtual visitors can take a tour from the air, from the water or even underwater to see shipwrecks which are hundreds of years old. Maps of the Blackwater River allow people to find their location and find out the water’s place in history. From the beginning of its use in recorded history, the Blackwater River became a highway to move goods like timber downriver for the Spanish crown. “Just to see waterways and the use they get, this is almost unbelievable. We still had this and so few people use it,” said Doug Lasater with a conservation group committed to the Blackwater River. He also hopes the threefold mapping will catch on in other areas and encourage preservation nationwide. “This is the way we share what we have with the rest of the community in the surrounding area and out of state,” Lasater said. On the surface of the water, Ryan Abrahamson coasts along the water. A tower with 360-degree cameras is taking pictures for the tour. He believes the online tour encourages people who can’t make it out the river to protect it while giving them a history of the area. “Underneath that dark surface is dozens of shipments and underwater structures that have been there from day one. so this allows you to actually see something of that so you can participate with something under the water,” Abrahamson said. Covering the underwater portion are West Florida Marine Archaeology graduates and students. including local Kenyan Murell. “I now appreciate it a whole lot more once you find out the history and you just find out the resources this area has culturally,” said Murell. For the boy from Bagdad, the project opened his eyes to the sanctuary and hopes his work will do the same for others. “I want to try to have my part and find out as much as I can and bring it for everyone to see,” said Murell. The virtual tour project was made possible by grants from the Santa Rosa tourism development council, a state grant, and money from Florida Coastal Management. On Thursday, the nonprofit Bagdad Waterfronts Florida Partnership Inc. will be part of a boating expedition that will highlight heritage tourism while covering much of the river that’s known for its tannic water and sandy bottom. BAGDAD — By early next year, outdoor and history enthusiasts who have an internet connection could be able to explore much of the Blackwater River without leaving home. 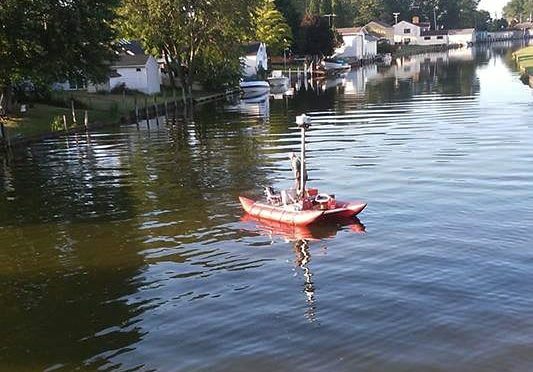 The organization will partner with the Richmond, Virginia-based Terrain 360 to obtain high-resolution, 360-degree images of the river for a digital-image map. About 25 miles of the 58-mile-long Blackwater River will be photographed to create the virtual Blackwater Maritime Heritage Trail. The river’s headwaters start in south Alabama, and 49 miles of the waterway meander through Okaloosa and Santa Rosa counties. Overall, the creators of the virtual trail aim to protect and help educate people about the cultural resources of Santa Rosa County. The state-supported partnership works to protect and enhance the Bagdad Waterfront, which encompasses the Blackwater River, Pond Creek and Oakland Basin. Lasater said many ships that continue to rest on the river’s bottom sank during and well before the 1930s. They include vessels that were destroyed during the Civil War. Graduate students from the University of West Florida will be an important part of Thursday’s endeavor, Lasater said. They’ll share with other trip participants various details about the historic uses of the river while also helping to document the waterway. “Students will be able to come back years later to document the sunken ships and see how things deteriorate in freshwater,” Lasater said. During Thursday’s trip, members of Terrain 360 will photograph the river with six cameras mounted 10 feet above the water’s surface while cruising on a pontoon raft. Images will be taken every 40 feet and later joined together to create the digital-image map. Lasater said the virtual trail will enable a wider audience to enjoy the Blackwater River in the form of an immersive, 360-degree, web-based “choose your own adventure tour.” During the tour, users will be able to learn about historic sites, including old industrial mills that now are public parks, such the Bagdad Mill Site Park. The virtual trail could later be expanded to include the Yellow River and other waterways in the local region. Funding assistance for the roughly $32,000 first phase of the trail project comes from the Santa Rosa County Tourist Development Council, the state Office of Greenways and Trails and the Bagdad Waterfronts Florida Partnership. Members of the Blackwater Pyrates, a community service-based organization serving the Bagdad and Milton areas, have donated labor and boats to help map the trail. “Barring any weather issues, we should have something to the public by January,” Lasater said of the virtual trail. Patuxent River 360 Virtual Tour Coming to Chesapeake Conservancy. Anyone, anywhere, will soon be able to see the entire Patuxent River with the Chesapeake Conservancy’s 360 degree virtual tour. 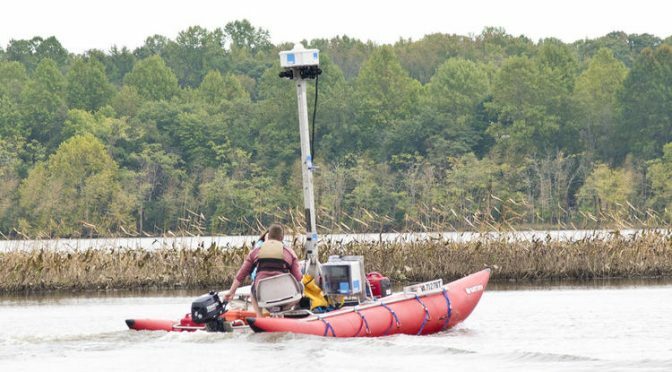 Starting Oct. 10, the Patuxent can be seen from a kayaker’s perspective Google Street View-style, which provides a look at the water, outlining land, boat ramps and access sites. Highlights of tour include the protected waters of Jug Bay Wetland Sanctuary and the scenic Battle Creek Cypress Swamp Sanctuary. “Many of the folks who have checked out our virtual tours are using them to plan their boating and paddling adventures,” said Jody Couser, director of communications for the Conservancy. The Patuxent is the 11th river the Conservancy has mapped of the Captain John Smith Chesapeake National Historic Trail, the country’s first all-water national historic trail, which follows Captain John Smith’s exploration of the Chesapeake. Since 2014, the group has also documented the Patapsco, Potomac, Susquehanna, York, Elk, James, Nanticoke, Northeast, Rappahannock and Sassafras rivers. The Riverview tour is the brainchild of Ryan Abrahamsen. 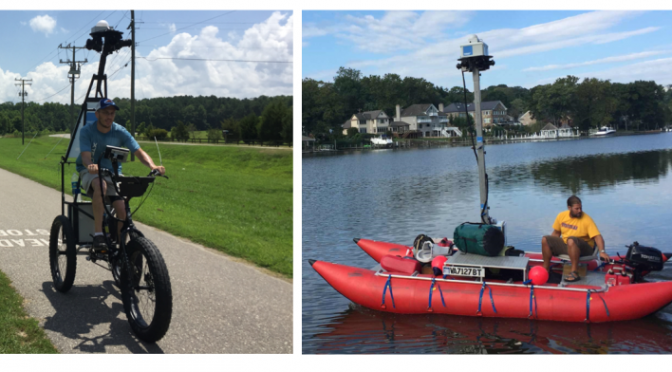 Based in Richmond, VA, Abrahamsen has set out to “map the world 360 degrees at a time” with his company, Terrain 360. 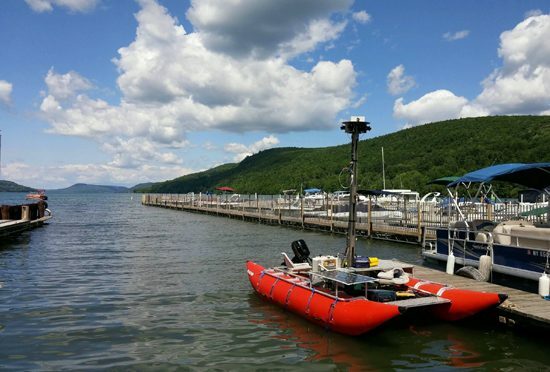 To do so, he crafted a pontoon raft with a built-in waterproof computer that controls six special cameras atop a 12-foot telescoping tower. Abrahamsen says the 360 pontoon cost about $15,000 and is pricey to maintain. But he and the Conservancy are confident the views are worth the price and more. Couser notes the tours can be informative to educators and conservationists. The cameras on Abrahamsen’s pontoon capture 20,000 to 30,000 images a day, which are edited into a Riverview virtual tour. While he says editing is fairly easy, capturing waterways can have its difficulties. Wind and waves are a challenge, shooting can’t be done in the rain, and he has to wrap up before the sun starts to set. Then there are the photo bombers. For those planning hiking and biking, Terrain 360 also captures land-locked trails. They’ve mapped locations around the U.S. including North Carolina’s Outer Banks and the Appalachian Trail’s Bearfence Mountain. Next he hopes to outline the Chesapeake and capture the Intracoastal Waterway. The Patuxent River tour can be seen at chesapeakeconservancy.org.